Trench fever is a clinical syndrome caused by infection with Bartonella quintana; the condition was first described during World War I. Contemporary B quintana disease, commonly referred to as urban trench fever, is typically found in homeless, alcoholic, and poor populations. 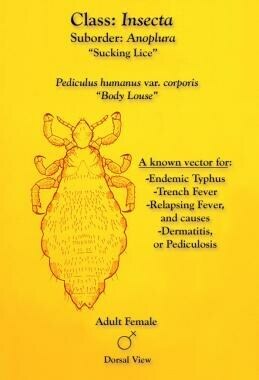 The human body louse Pediculus humanus var corporis is the major vector involved in trench fever transmission [1, 2] (see the image below). Dorsal view of female body louse, Pediculus humanus var corporis. This louse is a known vector responsible for transmission of epidemic typhus, trench fever, and Asiatic relapsing fever; it also causes dermatitic condition known as pediculosis. Image courtesy of Centers for Disease Control and Prevention. Urban trench fever typically includes 1 or more of these symptoms, but the presentation tends to be more variable. Many patients with microbiologic or serologic evidence of B quintana infection are asymptomatic. See Presentation for more details. See Workup for more details. Surgical biopsy may help diagnose B quintana endocarditis, lymphadenopathy, or bacillary angiomatosis. Valve replacement surgery is required in most cases of B quintana endocarditis. See Treatment and Medication for more details. Trench fever is a clinical syndrome caused by infection with Bartonella quintana. The condition was first described during World War I, when it affected nearly 1 million soldiers. [3, 4, 1, 2] It has been known by several different names, including quintan fever, 5-day fever, shin bone fever, tibialgic fever, Wolhynia fever, and His-Werner disease. DNA studies have demonstrated that many soldiers in Napoleon’s Grand Army at Vilnius in the 19th century were infected with B quintana. In addition, B quintana DNA was found in a 4000-year-old human tooth in Roaix, France. [5, 6] Reports of trench fever outbreaks stopped after World War I and then reappeared transiently on the Eastern Front in Europe during World War II. By the end of World War I, the human body louse Pediculus humanus was recognized as the likely vector for trench fever transmission. [1, 2] Rickettsia -like organisms in the body and feces of P humanus were postulated to be the cause. In 1969, Vinson et al successfully cultivated the causative organism (then called Rickettsia quintana) from a sick patient and reproduced the disease by inoculating healthy volunteers. The organism was briefly placed in the genus Rochalimaea before being reclassified as Bartonella quintana in 1993. During World War I, trench fever was characterized by the abrupt onset of fever, malaise, myalgias, headache, transient macular rashes of the torso, pain in the long bones of the leg (shins), and splenomegaly. [8, 9, 1, 2, 3, 4, 10, 11] Typical periodic cycles of fever, chills, and sweats occurred at 5-day intervals, resulting in prolonged disability lasting 3 months or longer in young soldiers. However, no deaths attributable to trench fever have ever been reported. Over the past 3 decades, Bartonella species have emerged as a cause of bacteremia, angioproliferative disease (eg, bacillary angiomatosis), and endocarditis in patients with and without HIV infection. In 1995, B quintana was found to cause bacteremia in 10 homeless, HIV-negative alcoholics. In 1999, B quintana endocarditis was described in 3 HIV-negative homeless alcoholic men. These cases suggest that B quintana disease is not limited to wartime outbreaks or immunocompromised persons. Subsequently, sporadic cases and small clusters of B quintana infection have been described worldwide and appear to be associated with poor sanitation, poor hygiene, alcoholism, and malnutrition—all of which are commonly seen in both classic and urban trench fever cases. Seroprevalence studies suggest that B quintana infection is more common than is clinically recognized and that many infections are subclinical. The term urban trench fever is applied to contemporary B quintana disease. Urban trench fever is typically found in homeless, alcoholic, and poverty-stricken populations, among whom poor personal hygiene is common. The infection affects both immunocompetent and immunocompromised persons. Some (but not all) persons with urban trench fever have evidence of louse infestation. Breaks in the skin contaminated by louse feces and arthropod bites are documented portals of entry. Other possible vectors include mites, ticks, and fleas. A 2014 study showed that cat fleas (Ctenocephalides felis) can ingest B quintana and release viable bacteria into their feces. Contamination of mucous membranes, transfusion, transplantation, and IV drug abuse are also potential avenues of entry. Human-to-human transmission of trench fever has not been described. Predisposing factors for B quintana infection include war, famine, malnutrition, homelessness, alcoholism, intravenous (IV) drug abuse, and poor hygiene. B quintana was found in the lice of 33.3% of body lice–infested and 25% of head lice–infested homeless persons in California. In one study, 20% of the patients in a downtown Seattle clinic that serves a homeless indigent population had microimmunofluorescent antibody titers of 1:64 or greater to Bartonella species. Multivariate analysis of these patients revealed that alcohol abuse was the only independent variable associated with seropositivity. It is difficult, however, to ascertain the true incidence of urban trench fever, as most infected individuals are asymptomatic. Moreover, the disease occurs sporadically and in small clusters of homeless persons. Whereas trench fever described during wartime typically affected young soldiers, urban trench fever typically affects middle-aged adults. Rare cases of Bartonella endocarditis and central nervous system (CNS) infection have been described in children. Because trench fever was historically an infection of soldiers, most of the cases documented during World Wars I and II were in males. Cases of urban trench fever described since 1995 have also predominantly involved males, reflecting the disproportionate representation of males in the homeless alcoholic population. No convincing data suggest that urban trench fever or other syndromes caused by B quintana infection have a racial or ethnic predilection. In most immunocompetent hosts, B quintana infection is self-limited unless endocarditis occurs. In immunocompromised hosts, however, B quintana infection tends to be more severe and may result in death. Patients should be educated about practicing good personal hygiene and improving their living conditions. Vector control of the body louse should also be explained. McNee JW, Renshaw A, Brunt EH. Trench Fever. Brit Med J. 1916. i:225-34. Byam W, Carroll JH, Churchill L, Dimond VE, Sorapure VE, Wilson RM, et al. Trench fever: a louse-born disease. London: Oxford University Press; 1919. Graham JHP. A note on a relapsing febrile illness of unknown origin. Lancet. 1915. ii:703-4. Hunt GH, Rankin AC. Intermittent fever of obscure origin occurring among British soldiers in France. The so-called "trench fever.". Lancet. 1915. ii:1133-6. Raoult D, Dutour O, Houhamdi L, Jankauskas R, Fournier PE, Ardagna Y, et al. Evidence for louse-transmitted diseases in soldiers of Napoleon's Grand Army in Vilnius. J Infect Dis. 2006 Jan 1. 193(1):112-20. [Medline]. Drancourt M, Tran-Hung L, Courtin J. Bartonella quintana in a 4000-year-old human tooth. J Infect Dis. 2005 Feb 15. 191(4):607-11. [Medline]. Vinson JW, Varela G, Molina-Pasquel C. Trench fever. 3. Induction of clinical disease in volunteers inoculated with Rickettsia quintana propagated on blood agar. Am J Trop Med Hyg. 1969 Sep. 18(5):713-22. [Medline]. Ruhrah J. Infectious Disease. Hare HA, ed. Progressive Medicine. Philadelphia and New York: Lea & Febiger; 1919. Vol 1: 151-244. Maurin M, Raoult D. Bartonella (Rochalimaea) quintana infections. Clin Microbiol Rev. 1996 Jul. 9(3):273-92. [Medline]. Biswas S, Rolain JM. Bartonella infection: treatment and drug resistance. Future Microbiol. 2010 Nov. 5(11):1719-31. [Medline]. Peacock A, Pearson W. The Peacock versus the louse (pediculus humanus corporis): one soldier's contribution to combating trench fever in the First World War. J R Coll Physicians Edinb. 2010 Sep. 40(3):256-62. [Medline]. Matera G, Liberto MC, Joosten LA, Vinci M, Quirino A, Pulicari MC, et al. The Janus face of Bartonella quintana recognition by Toll-like receptors (TLRs): a review. Eur Cytokine Netw. 2008 Sep. 19(3):113-8. [Medline]. Brouqui P, Lascola B, Roux V, Raoult D. Chronic Bartonella quintana bacteremia in homeless patients. NEJM. Jan/1999. 340(3):184-9. [Medline]. Foucault C, Brouqui P, Raoult D. Bartonella quintana characteristics and clinical management. Emerg Infect Dis. Feb/2006. 12(2):217-23. [Medline]. Piérard-Franchimont C, Quatresooz P, Piérard GE. Skin diseases associated with Bartonella infection: facts and controversies. Clin Dermatol. 2010 Sep-Oct. 28(5):483-8. [Medline]. Rolain JM, Foucault C, Guieu R, Lascola B, Brouqui P, Raoult D. Bartonella quintana in human erythrocytes. Lancet. July/2002. 360(9328):226-8. [Medline]. Dehio C. Molecular and cellular basis of bartonella pathogenesis. Annu Rev Microbiol. 2004. 58:365-90. [Medline]. Capo C, Amirayan-Chevillard N, Broqui P, Raoult D, Mege JL. Bartonella quintana bacteremia and overproduction of interleukin-10: Model of bacterial persistence in homeless people. JID. Oct, 2003. 187:837-44. [Medline]. LaScola B, Raoult D. Culture of Bartonella quintana and Bartonella henselae from human samples: a 5-year experience (1993 to 1998). J Clin Microbiol. 1999 Jun;37(6):1899-905. [Medline]. [Full Text]. Liberto MC, Matera G, Lamberti AG, Barreca GS, Quirino A, Foca A. In vitro Bartonella quintana infection modulates the programmed cell death and inflammatory reaction of endothelial cells. Diagn Microbiol Infect Dis. Feb/2003. 45(2):107-15. [Medline]. Schulte B, Linke D, Klumpp S, Schaller M, Riess T, Autenrieth IB, et al. Bartonella quintana variably expressed outer membrane proteins mediate vascular endothelial growth factor secretion but not host cell adherence. Infect Immun. 2006 Sep. 74(9):5003-13. [Medline]. [Full Text]. O'Rourke LG, Pitulle C, Hegarty BC, Kraycirik S, Killary KA, Grosenstein P, et al. Bartonella quintana in cynomolgus monkey (Macaca fascicularis). Emerg Infect Dis. 2005 Dec. 11(12):1931-4. [Medline]. [Full Text]. Ohl ME, Spach DH. Bartonella quintana and urban trench fever. Clin Infect Dis. 2000 Jul. 31(1):131-5. [Medline]. Breitschwerdt EB, Maggi RG, Sigmon B, Nicholson WL. Isolation of Bartonella quintana from a woman and a cat following putative bite transmission. J Clin Microbiol. 2007 Jan. 45(1):270-2. [Medline]. [Full Text]. La VD, Tran-Hung L, Aboudharam G, Raoult D, Drancourt M. Bartonella quintana in domestic cat. Emerg Infect Dis. 2005 Aug. 11(8):1287-9. [Medline]. [Full Text]. Brouqui P, Houpikian P, Dupont HT, Toubiana P, Obadia Y, Lafay V, et al. Survey of the seroprevalence of Bartonella quintana in homeless people. Clin Infect Dis. 1996 Oct. 23(4):756-9. [Medline]. Kernif T, Leulmi H, Socolovschi C, Berenger JM, Lepidi H, Bitam I, et al. Acquisition and excretion of Bartonella quintana by the cat flea, Ctenocephalides felis felis. Mol Ecol. 2014 Mar. 23(5):1204-12. [Medline]. Bonilla DL, Kabeya H, Henn J, Kramer VL, Kosoy MY. Bartonella quintana in body lice and head lice from homeless persons, San Francisco, California, USA. Emerg Infect Dis. 2009 Jun. 15(6):912-5. [Medline]. [Full Text]. Jackson LA, Spach DH. Emergence of Bartonella quintana infection among homeless persons. Emerg Infect Dis. 1996 Apr-Jun. 2(2):141-4. [Medline]. [Full Text]. Tea A, Alexiou-Daniel S, Arvanitidou M, Diza E, Antoniadis A. Occurrence of Bartonella henselae and Bartonella quintana in a healthy Greek population. Am J Trop Med Hyg. 2003 May. 68(5):554-6. [Medline]. Ehrenborg C, Byström R, Hjelm E, Friman G, Holmberg M. High Bartonella spp. seroprevalence in a Swedish homeless population but no evidence of trench fever. Scand J Infect Dis. 2008. 40(3):208-15. [Medline]. Seki N, Sasaki T, Sawabe K, Sasaki T, Matsuoka M, Arakawa Y, et al. Epidemiological studies on Bartonella quintana infections among homeless people in Tokyo, Japan. Jpn J Infect Dis. 2006 Feb. 59(1):31-5. [Medline]. da Costa PS, Brigatte ME, Greco DB. Antibodies to Rickettsia rickettsii, Rickettsia typhi, Coxiella burnetii, Bartonella henselae, Bartonella quintana, and Ehrlichia chaffeensis among healthy population in Minas Gerais, Brazil. Mem Inst Oswaldo Cruz. 2005 Dec. 100(8):853-9. [Medline]. Raoult D, Birtles RJ, Montoya M, Perez E, Tissot-Dupont H, Roux V, et al. Survey of three bacterial louse-associated diseases among rural Andean communities in Peru: prevalence of epidemic typhus, trench fever, and relapsing fever. Clin Infect Dis. 1999 Aug. 29(2):434-6. [Medline]. Vilibic-Cavlek T, Karlovic-Martinkovic D, Ljubin-Sternak S, Tabain I, Persic Z, Mlinaric-Galinovic G. High prevalence of Bartonella henselae and Bartonella quintana antibodies in Croatian patients presenting with lymphadenopathy. Pol J Microbiol. 2012. 61(4):315-7. [Medline]. Drancourt M, Mainardi JL, Brouqui P, Vandenesch F, Carta A, Lehnert F, et al. Bartonella (Rochalimaea) quintana endocarditis in three homeless men. N Engl J Med. 1995 Feb 16. 332(7):419-23. [Medline]. Woolley MW, Gordon DL, Wetherall BL. Analysis of the first Australian strains of Bartonella quintana reveals unique genotypes. J Clin Microbiol. 2007 Jun. 45(6):2040-3. [Medline]. [Full Text]. Yoda M, Hata M, Sezai A, Unosawa S, Furukawa N, Minami K. First report of Bartonella quintana endocarditis in Japan. Circ J. 2008 Jun. 72(6):1022-4. [Medline]. Znazen A, Rolain JM, Hammami N, Kammoun S, Hammami A, Raoult D. High prevalence of Bartonella quintana endocarditis in Sfax, Tunisia. Am J Trop Med Hyg. 2005 May. 72(5):503-7. [Medline]. Balakrishnan N, Menon T, Fournier PE, Raoult D. Bartonella quintana and Coxiella burnetii as causes of endocarditis, India. Emerg Infect Dis. 2008 Jul. 14(7):1168-9. [Medline]. [Full Text]. Raoult D, Fournier PE, Vandenesch F, Mainardi JL, Eykyn SJ, Nash J, et al. Outcome and treatment of Bartonella endocarditis. Arch Intern Med. 2003 Jan 27. 163(2):226-30. [Medline]. Fournier PE, Lelievre H, Eykyn SJ, Mainardi JL, Marrie TJ, Bruneel F, et al. Epidemiologic and clinical characteristics of Bartonella quintana and Bartonella henselae endocarditis: a study of 48 patients. Medicine (Baltimore). 2001 Jul. 80(4):245-51. [Medline]. Foucault C, Barrau K, Brouqui P, Raoult D. Bartonella quintana Bacteremia among Homeless People. Clin Infect Dis. 2002 Sep 15. 35(6):684-9. [Medline]. Koo M, Manalili S, Bankowski MJ, Sampath R, Hofstadler SA, Koo J. A "silent culture-negative" abdominal aortic mycotic aneurysm: Rapid detection of Bartonella species using PCR and high-throughput mass spectrometry. Hawaii Med J. 2010 Mar. 69(3):68-9. [Medline]. [Full Text]. CLSI. Principles and Procedures for Blood Cultures: Approved Guidelines. 2007. Available at http://www.clsi.org. Larson AM, Dougherty MJ, Nowowiejski DJ, Welch DF, Matar GM, Swaminathan B, et al. Detection of Bartonella (Rochalimaea) quintana by routine acridine orange staining of broth blood cultures. J Clin Micro. June/1994. 32(6):1492-6. [Medline]. Rahimian J, Raoult D, Tang YW, Hanna BA. Bartonella quintana endocarditis with positive serology for Coxiella burnetii. J Infect. Sept /2006. 53(3):e151-3. [Medline]. Rolain JM, Broqui P, Koehler JE, Maguina C, Dolan MJ, and Raoult D. Recommendations for treatment of human infections caused by Bartonella species. Antimicrob Agents Chemo. June 2004. 48(6):1921-33. [Medline]. Myers WF, Grossman DM, Wisseman CL Jr. Antibiotic susceptibility patterns in Rochalimaea quintana, the agent of trench fever. Antimicrob Agents Chemother. 1984. 25:690-3. [Medline]. Rolain JM, Maurin M, Mallet MN, Parzy D, Raoult D. Culture and antibiotic susceptibility of Bartonella quintana in human erythrocytes. Antimicrob Agents Chemother. 2003 Feb. 47(2):614-9. [Medline]. Foucault C, Raoult D, Brouqui P. Randomized open trial of gentamicin and doxycycline for eradication of Bartonella quintana from blood in patients with chronic bacteremia. Antimicrob Agents Chemother. 2003 Jul. 47(7):2204-7. [Medline]. Prutsky G, Domecq JP, Mori L, Bebko S, Matzumura M, Sabouni A, et al. Treatment outcomes of human bartonellosis: a systematic review and meta-analysis. Int J Infect Dis. 2013 Oct. 17(10):e811-9. [Medline]. Brouqui P, Stein A, Dupont HT, Gallian P, Badiaga S, Rolain JM, et al. Ectoparasitism and vector-borne diseases in 930 homeless people from Marseilles. Medicine (Baltimore). 2005 Jan. 84 (1):61-8. [Medline]. Badiaga S, Raoult D, Brouqui P. Preventing and controlling emerging and reemerging transmissible diseases in the homeless. Emerg Infect Dis. 2008 Sep. 14 (9):1353-9. [Medline]. Cerimele F, Brown LF, Bravo F, Iher GM, Kouadio P, Arbiser JL, et al. Infectious angiogenesis: Bartonella bacilliformis infection results in endothelial production of angiopoetin-2 and epidermal production of vascular endothelial growth factor. Am J Pathol. Oct 2003. 163:1321-7. [Medline]. Kostrzewski J. The epidemiology of trench fever. Bull Acad Pol Sci (Med). 1949. 7:233-63. [Medline]. Popa C, Abdollahi-Roodsaz S, Joosten LA, Takahashi N, Sprong T, Matera G, et al. Bartonella quintana lipopolysaccharide is a natural antagonist of Toll-like receptor 4. Infect Immun. Oct/2007. 75(10):4831-7. [Medline]. The author would like to thank A Clinton White, MD, for his encouragement and suggestions during the composition of this article. The authors and editors of Medscape Reference also gratefully acknowledge the contributions of previous author Eleftherios Mylonakis, MD, and previous coauthor Michael Forgione, MD, to the development and writing of this article.